Go Kart Design Challenge is a contest formulated to enhance the approach of students practicing Engineering and Diploma courses. This event is fundamentally all about designing and fabricating a Go Kart at very low expenditure. We expect the teams to manufacture Go Karts yielding optimum performance. The teams participating in this contest have to go through two rounds, Pre-Final Round (PFR) and Final Round (FR). It will be mandatory for all the teams to clear the PFR in order to advance to the FR. 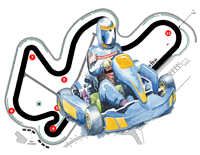 Teams are required to manufacture their Go Karts without any direct/indirect involvement of any kind of Professional help.